Bowties, Butterflies, and Band-Aids. That’s what childhood cancer looks like, according to Lyndsey VanDyke. 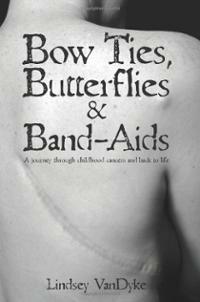 This memoir shares VanDyke’s “journey through childhood cancers and back to life.” From her first diagnosis with Wilm’s tumor at 11 to her relapse at 13 to her secondary thyroid cancer at 21, VanDyke’s coming-of-age has been especially scarred by cancer. With the voices of her family, friends, and care team alongside her own, VanDyke contextualizes her experiences within the views of others. She provides a more holistic perspective through this multiple lenses. She organizes her reflections as The Cancer, Aftermath, and Reconstruction. In doing so, she illuminates her post-cancer experience, such as the paranoia from her numerous encounters, her experiences living in fear. Even after pursuing a career in journalism, VanDyke realizes that her heart lies in medicine. She sets out on the path to medical school, eventually finding her place in Osteopathic Medicine. “It occurred to me that medical school really wasn’t all that different from a cancer experience. It would be exhausting. It would strain my relationships. It would be insanely expensive” (307). And now, she’s Dr. VanDyke.